As a ScrumMaster you are passionate in supporting your team, a true servant leader aiming to help the people you work with achieving their best and, at the same time, you act as an organisation-wide change agent. Scrum seems easy at first sight, but using it effectively is a much more difficult challenge: to be successful in your job you need to understand Scrum way beyond the basics in order to be able to use it in an optimal way and exploit its full benefits. Whether you are using Scrum already or you are just planning to start with it, learning the foundations of the role is an important step in understanding Scrum and other agile methods. In this two-day training we will look at Scrum in the context of agility, understanding how and why it works, the roles and their interactions and everything needed to start working effectively as a ScrumMaster with a team. 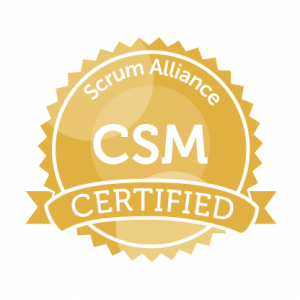 At the end of the course you will be able to access the certification exam of the Scrum Alliance, the biggest and best known certification body for agility. After successful completion you will be a Certified ScrumMaster. Below you find a list with the currently scheduled public courses with the possibility to register online. If you are interested in having this course as a in-house please tell us about it using the Contact Form Course and we’ll come back to you. The course is intended for ScrumMasters, managers and developers in organisations who are starting to use Scrum and, generally, for all professionals interested in achieving the Certified ScrumMaster certification. Very interesting session, lot of interactions & discussions among participants.